Last year my dear husband took me on a date—the local beekeepers monthly meeting at Logon Café. It seemed interesting, the food was satisfying–and I didn’t cook or wash the dishes. We attended several more and I decided that it might be fun to have bees. 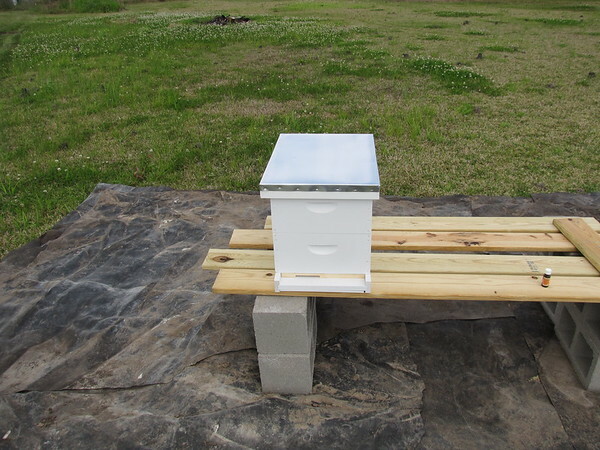 So I bought a hive, set it up==I got a beekeeping suit complete with gloves, hood for my birthday, salted the hive with lemongrass oil in the hopes of capturing a swarm. Yesterday the Liberty county beekeeping society held an interest day at the local extension office. Their office is in a converted school and their exhibit was in one of the classrooms. The sidewalk was chalked with pink bees—all the working bees are girls. So I inspected a hive through glass, watched a honey extractor, tasted comb–I was supposed to spit out the wax—I remember eating it–honey was a rare treat for us, and then watched viscosity testing–apparently it is about 21 to 23%==and the bees do it without any testing equipment. Now I must wait for the spring to get some bees.